Researchers who have taken up Ancestry's offer to switch to the "improved" site are in uproar over the changes to their family trees - ancestors who lived in Britain all their lives have suddenly been transplanted to other countries. I know from emails I've received from other LostCousins members that all sorts of anomalies are becoming apparent, though as far I can tell the underlying data isn't being corrupted. All the more reason, I'd venture to suggest, for NOT making your Ancestry 'public'. 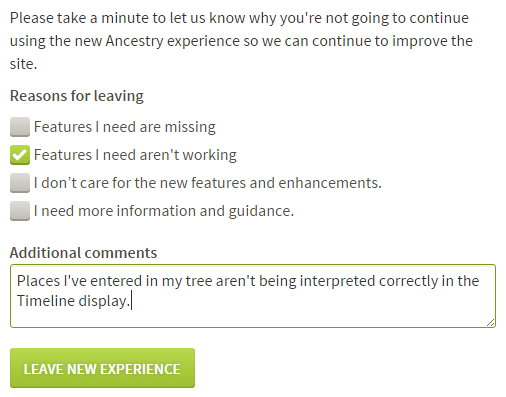 User feedback was incredibly important when Ancestry last made a major change to their site a few years - the switch from the 'Old Search' to the 'New Search' was incredibly controversial and, thanks to the efforts of subscribers like you and me, we ended up with the best of both worlds. Readers of this newsletter can save £20 on all NEW annual subscriptions to Findmypast - but only until 20th August. For example, this brings the cost of their most popular subscription - the BRITAIN subscription - down to a mere £79.60 (less than 22p a day). Or buy a WORLD subscription from Findmypast.co.uk for just £103.60 (under £2 a week - less than the cost of some Sunday papers). I've also negotiated similar savings at other Findmypast sites around the world. Note: these offers are for new subscribers. If you've been a Findmypast subscriber in the past you may qualify - it doesn't do any harm to try - but I can't guarantee it. If the links don't work for you please disable the adblocking extension in your browser before trying again. Should you not make your purchase immediately, please click the link again when you do - otherwise LostCousins won't benefit. If you want to share this offer with friends or relatives, that's fine with me, but please do it by sending them a link to this newsletter, and not a link to the offer page. Claim a FREE LostCousins subscription! When you take up Findmypast's offer using one of the links above you'll also be supporting LostCousins - so as one good turn deserves another, I'm going to give you a FREE LostCousins subscription worth up to £12.50! When you take out a new World subscription under the offer you'll qualify for a 12 month LostCousins subscription; when you take out a new Local (eg Britain) subscription you'll qualify for a 6 month LostCousins subscription. Tip: if you already have a LostCousins subscription you can still benefit - I'll extend the expiry date. 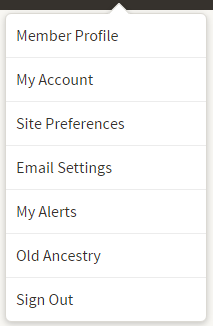 All you need to do is forward a copy of the email receipt you receive from Findmypast showing the date and time (your LostCousins subscription will run from that date, so it's best to get your claim in as soon as possible), and quoting your LostCousins membership number, which is shown on your My Summary page. You can forward it to any of the LostCousins email addresses, including the one I wrote from when I told you about this newsletter. If you want to benefit from a joint subscription, covering two LostCousins accounts, you must link them together before forwarding the receipt; to find out how to link the accounts just log-in and go to the Subscribe page (it takes 2 minutes and only needs to be done once). Terms and conditions: your Findmypast subscription purchase cannot be combined with any other offer; you must click the link for the Findmypast site where you buy your subscription (and you must do it before buying the subscription), otherwise the purchase won't benefit LostCousins and you won't qualify for your free LostCousins subscription. Upgrades, downgrades, and renewals do not qualify for this offer - your subscription might count as a renewal even if your previous subscription lapsed some time ago, but if LostCousins benefits, then so will you. It's just over a year since Findmypast launched the first phase of their Staffordshire Collection, comprising 2.8 million records from baptism, marriage, and burial registers - with this second phase they are now nearly 4 million records online out of an eventual 6 million. Included in the latest release you'll find the 1894 baptism of Vera Brittain whose memoir Testament of Youth, published in 1933, has recently been turned into a film (though whether it matches the superb BBC series starring Cheryl Campbell I've yet to discover). It's also possible to browse the registers by following this link. No date has been given for the release of the remaining records, but I'd be surprised if we saw another release before the end of 2015. I recently discovered this YouTube clip which shows Findmypast working on the digitisation of the registers. You'll notice that in the comments below Findmypast are talking about a release date before the end of this year. I can't be certain that this valuable resource will be included in existing subscriptions, but I very much hope that will be the case. Let's keep our fingers crossed! Ancestry have just added over 300,000 index entries relating to apprentices who were indentured on Merchant Navy ships between 1824-1910 (under the Merchant Seamen Act of 1823 Masters of British merchant ships of 80 tons and over were required to carry a given number of indentured apprentices). You can search the indexes here. In a small number of cases the records to which the indexes refer are held by the National Archives, but sadly most were destroyed in a decluttering disaster. Wigan Borough Online War Memorial is the result of a project between Archives & Local Studies Volunteers and Wigan Council's First World War Commemoration Fund. They have tried to research every name listed on Wigan Council's war memorials, linking biographical information on the men and women who died during the war to thousands of digitised newspaper stories. You can search for individual people using the search tool or browse the newspaper reports. I know there have been projects all across the nation, but I felt that Wigan's efforts deserved a special mention! There are tens of thousands of wonderful clips in the British Movietone archive, which you can search and view completely free (though you'll have to pay to use any of the footage). In all there are over 10,000 hours of digitised video in the Associated Press archive, and as some events were recorded both by British Movietone and British Pathé (whose archive can be searched here) you can see them from more than one perspective. In my first few minutes of searching I found footage from 1931 of King George V opening the new hospital in Ilford where, 25 years later, I was to have my tonsils removed. Looking through other films from my home town I noticed June Whitfield, the actress, opening the new PDSA (People's Dispensary for Sick Animals) sanatorium in 1958 - it was on the site of the PDSA's (and Europe's) first animal sanatorium, which opened in 1928. My last visit to the Ilford sanatorium was in 1976 when our family dog had to be "put to sleep" after a stroke that left her paralysed. What will you find that reminds you of your youth? You'll often find fascinating information in parish registers that seemingly has little to do with the church - on one occasion I came across a list of trees planted in the church grounds, on another I found details of the payments made to parishioners who had helped to rid the parish of vermin. Warning: some people might find the recording, which describes activities in the 1920s and 1930s, upsetting. One of the great advantages of credit cards is the ability to spend money in almost any currency. I know that many people shy away from spending money in unfamiliar currencies, but as long as you get your calculations right (or use a site like XE.com which has a calculator) there are some big savings to be made, because exchange rates can fluctuate quite widely. Some of the biggest savings are on subscriptions for sites like Ancestry and Findmypast - for example, until the end of 2014 the cost of a World subscription to Ancestry was cheaper at their UK site than at any of the others, and I heard from several members who had saved $100 or more by switching. However from January 2015 Ancestry's subscription rates went up, even for existing subscribers, partly as a result of changes in the VAT rules. Other subscriptions are completely different - they typically include only local records, so price comparisons between different sites aren't usually relevant. But there's one important exception: you may find that a better subscription at another site is actually cheaper - for example, at current exchange rates a new World subscription to Findmypast costs less through their Australian site than a new Britain subscription bought at their British site. Similarly, for someone living in Australia a UK Heritage Plus subscription to Ancestry currently costs less than a Premium subscription at the UK site, even though it offers more records. UK subscribers to overseas Ancestry sites may have to pay an extra 20% to cover VAT; the precise amount will be shown only after you have entered your credit card details and gone to the Checkout (though before you have actually been charged). As far as I can tell UK subscribers to Findmypast's overseas sites pay the same rate as everyone else (but always check the price displayed immediately before you make a purchase). Findmypast offer a 10% Loyalty discount to existing subscribers who allow their subscription to be renewed automatically; Ancestry don't offer any loyalty incentives that I'm aware of. Both Ancestry and Findmypast will renew your subscription automatically unless you ask them not to; in the case of Findmypast you need only change a setting, but at Ancestry you must cancel your subscription, which takes a little longer (but is just as effective). Note that if you cancel an Ancestry annual subscription in the first 30 days you'll be given a full refund; otherwise your subscription will continue until the end of the 12 months that you've paid for (the same applies to the free subscriptions that come with some versions of Family Tree Maker). If you're in the UK you can also save money on Ancestry subscriptions by buying Family Tree Maker, even if you don't intend to use the software. For example, when I last checked you could buy the 2014 Platinum edition for under £40 at Amazon, even though it comes with a 6 month Premium subscription (normally £119.99 a year), whilst the 2012 World edition could be found for as little as £49.99 (it comes with a 6 month World subscription - this normally costs £179.99 a year). Although I haven't finished my latest series of articles on DNA testing I'm sure that some of you have already made your mind p about DNA testing. It's in that spirit that I'm passing on news of some discount offers that are ending very soon. Ancestry DNA are offering $20 off to customers in the US, bringing the price of their autosomal test down from $99 to a mere $79 when you follow this link - sadly here doesn't seem to be an equivalent offer in other countries. This offers runs until 17th August. Over at Family Tree DNA, where they offer a whole range of tests, you can save 15% on orders of $99 or more when you follow this link and use the code CJS2015, or else get $30 off when you spend $140 or more using the code CGS30 (these offers could end at any time - but they were both still working today). This week I read a news story which said that a judge in Argentina has ordered the exhumation of motor-racing legend Juan Manuel Fangio in order to resolve paternity cases involving two men in their 70s who are claiming (separately) to be his sons. Meanwhile, in England the author of a book on Jack the Ripper is hoping to exhume the body of Mary Jane Kelly, the Ripper's final victim - who he believes was really his great aunt, Elizabeth Weston Davies. You'd think he might have waited for the DNA results before rushing into publication, but my guess is that (a) he won't get permission for the exhumation (despite the optimistic note in this Telegraph article), and (b) even if he does get permission, the DNA results will disprove his hypothesis. I've recently finished reading the 2nd Edition of Celia Heritage's book, which includes a few, mostly minor, updates from the original 2013 version (so if you've already got that one there's absolutely no point buying the new one). However, when it was first released I didn't have time to review the book properly, so I welcomed the opportunity to set matters right - because Celia is not only a well-known and highly-respected lecturer who runs her own genealogical research company, she's also been a LostCousins member for 10 years. At one time I used to think that whilst records of births, baptisms, and marriages often provide vital clues, death certificates and burial records tend to reveal relatively little - so I didn't invest nearly as much time, effort, or money collecting them. This was a mistake - not least because it isn't just about death certificates and burial records, there are lots of other sources which come into play at the end of our ancestors' lives - wills, inventories, obituaries, inquest records, newspaper articles, headstone inscriptions are just a few examples. Celia carefully guides us through the process of finding and interpreting these records - then just as we think we've reach the end of the book she adds a short chapter entitled "Repercussions of Death and Reading Between the Lines". Here she offers intriguing suggestions, such as "if the deceased was a craftsman or tradesman of any sort, try to find out who took his place in the community after his death" - what a good idea! 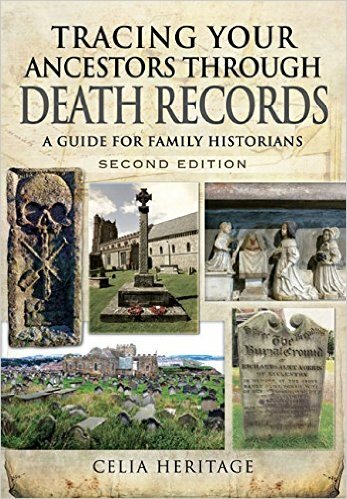 Both easy to read and a useful work of reference that will stay within easy reach on my bookshelf, Tracing Your Ancestors Through Death Records is an excellent guide to an often-neglected part of our research. There are more comprehensive books on individual topics, such as wills or causes of death, but no other book that I've read offers such a good overview of what's available. The cover price is £12.99 but I found new copies at under £9 (including postage) at Amazon; there is a Kindle version of the 1st edition which is cheaper still. Note: in the next newsletter I'll be following up with a review of How Our Ancestors Died by Simon Wills, an in-depth look at causes of death, and how they might be shown on a death certificate. Although I knew Les Law, the author of The Adopted Prisoner - his son and I went to the same primary school and the same secondary school, as well as belonging to the same Boys' Brigade company - I knew nothing of his wartime adventures (and they were adventures) until I read this excellent book. It's not a long book - I read it in a day - but I enjoyed every moment. It doesn't glorify war, nor try to make out that everyone on the winning side was a hero, and it certainly doesn't go into great detail into the construction of escape tunnels, as some books do. Nor does the author try to elicit our sympathy for the deprivations that he endured. This book is primarily about people: fellow soldiers, fellow PoWs, and especially the Italian villagers who befriended and helped our Tommies despite the great risk to their own safety (and that of their families). It ends with Les's return to Italy, 27 years after the war ended, to see the 'family' he left behind. For a time he was their son - they were his parents - and they never forgot each other. In a sense it isn't a war story, but a love story - but however it's categorised, this book is a shining example to anyone else thinking of writing their memoirs! I paid £8.07 for the paperback at Amazon, but they are printed on demand, so you might have to wait a few days (you can also buy an eBook - in PDF format - at Lulu.com). I hope you enjoy it as much as I did! I've reached the end of my tether as far as unwanted calls are concerned - I don't mind so much when there's a person on the other end who I can berate, but these days it's more likely that it'll be a recorded message. If I had my way the perpetrators of these frauds would be behind bars, and anyone involved in helping them, including the phone company that delivers the calls, should be liable to prosecution. But since that isn't going to happen any time soon I've just bought a BT8500 cordless phone with Call Guardian, which intercepts all calls other than those from trusted numbers. You can read an expert review of the phone here. I got a much better deal than the one quoted - for example, you can buy a twin phone system from Amazon for under £50. Even if you end up buying elsewhere, it's worth going to Amazon to read the customer reviews - the average rating, from well over a thousand reviews, was 4.6 out of 5 when I last checked, which is pretty much as good as it gets. Something else that annoys me is the way that supermarkets expect you to know what fits in a particular category and what doesn't. For example, when I got a Tesco coupon at the checkout recently which offered £1.50 off when I spent £6 on "any Healthcare products". There were a couple of things I needed, so next time I went shopping I picked them up - a bottle of Olbas Oil (great for clearing stuffed-up noses), and a bottle of Corsydyl, described on the NHS Choices website as a "medicine[which] helps treat or prevent gum inflammation and plaque formation and also helps to relieve the discomfort caused by mouth ulcers, inflammation and infections of the mouth". Some good news to end - with effect from 2nd September GiffGaff will be including 4G for the same price as 3G, and improving some of their 'goody bags' at the same time. If you've got an unlocked phone (or one that's locked to O2) it's worth ordering a free SIM and checking out the options. If you use this link you'll get a £5 credit the first time you top-up. Must dash because I'm hoping to see the Perseid meteor shower - assuming the cloud cover reduces. There will be another newsletter next week in which I'll continue my series of DNA articles. Please do not copy any part of this newsletter without permission. However, you MAY link to this newsletter or email a link to your friends and relatives without asking for permission in advance - though why not invite them to join LostCousins instead, since standard membership, which includes this newsletter, is FREE?